Note: This was taken from the [Weekend Dashboard] report, published to members of my premium research service, EPB Macro Research, every Sunday. Click here to learn more and try EPB Macro Research for a free two weeks. Despite a dovish pivot from the Fed, the US dollar remains strong. Emerging market currencies continue to look weaker against the US Dollar. Typically when global growth accelerates, capital flows out of the US into higher return areas such as emerging markets. This is why the FX market is often the most leading market. If there is a sense that economic growth globally is going to accelerate, capital will move into higher interest rate areas in terms of fixed income, infrastructure, equities or risk assets in general. Below is a table of 44 currency cross rates or indices and the performance over six-time durations. 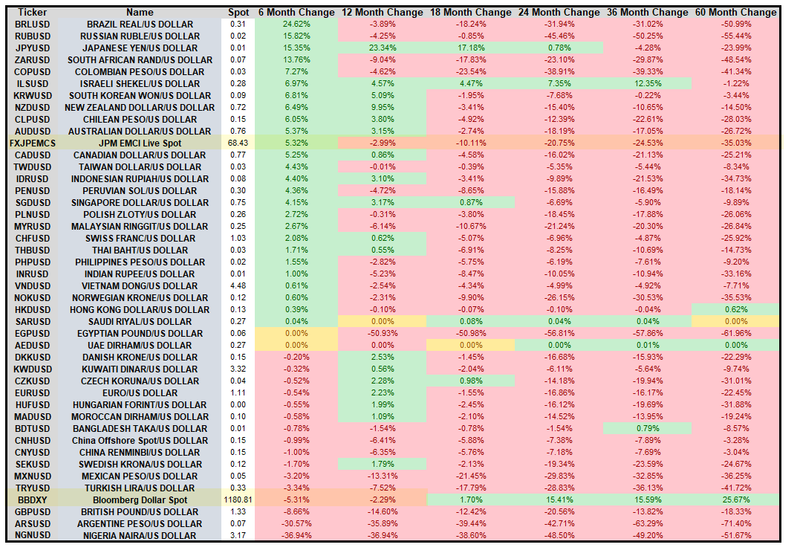 Over the past six months, roughly half the currencies tracked have strengthened against the US dollar as the Fed made their pivot and interest rates on the short-end declined about 100 basis points. As interest rates neared 3% on short-term US bonds, and the Fed signaling that rates could go even higher, capital fled emerging markets because you could earn 3% in the US with no risk. As rates fell 100 basis points, EM currencies stabilized. 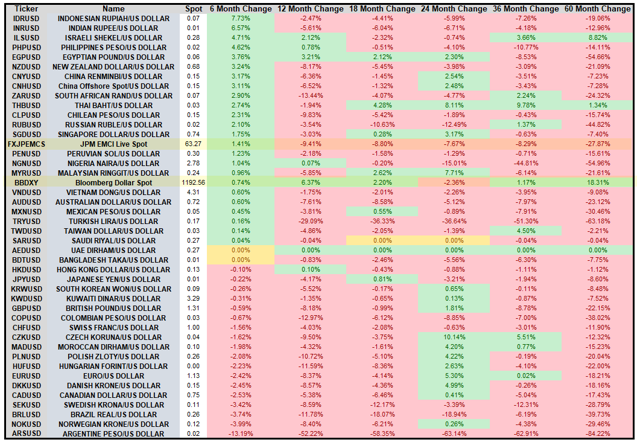 In aggregate, the Bloomberg dollar index is still up over the past six and twelve months and the EM currency index is up 1.4% in the past six months, but down nearly 10% over the past twelve months. If we contrast the table above with how the exact same table looked in July of 2016, when interest rates bottomed and the US/global economy reaccelerated, we can see some differences. 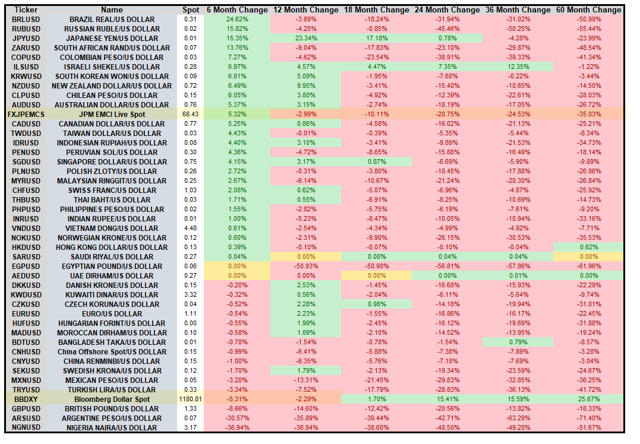 As the global economy accelerated, the dollar index was at the bottom of the list in terms of the six-month trends and was also down over the preceding twelve-month period. 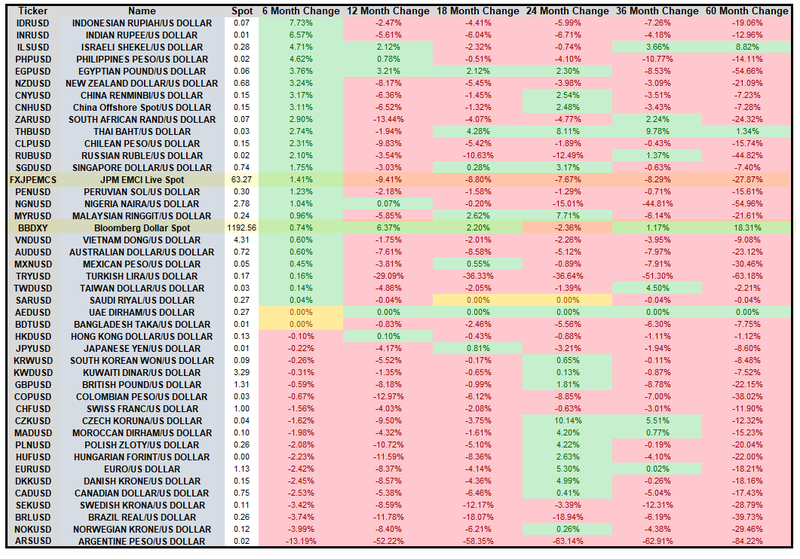 EM currencies, as a basket, were at the top of the list, up over 5% in the preceding six-month period with a handful of higher risk currencies up double digits in six months. If we see global currencies accelerating strongly against the US dollar, more so than a few percentage points of stabilization after US short-term rates declined by 100 basis points, that would be a strong signal that capital is moving. The [Weekend Dashboard] report is the most comprehensive macro report available covering stocks, bonds, commodities, money supply, international trends and more. "The weekly report is the best place to find all the up-to-date important info in a single place. I find it the most valuable product that you provide." "I have greatly appreciated your analysis and approach. Retired and managing family portfolios, which are better off for following your reports." "The report is great and very comprehensive"
There is no risk in trying EPB Macro Research and getting a copy of this full report by starting a 14-day free trial. Simply cancel at any point in the first 14-days if you are not finding value and you will never be charged. After getting this report each weekend, it will become an integral part of your investing process and help protect you from unseen events that can cause large losses as we saw in December of last year.